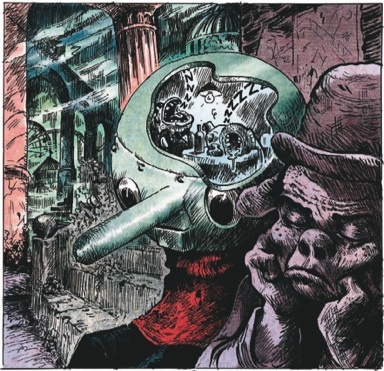 Winshluss’ Pinocchio was the big buzz book of the Angoulême festival this year and it came as little surprise that it ended up taking the Fauve d’Or award — the festival’s prize for comic of the year, and one of the greatest distinctions of its kind. It’s an impressive package — a large hardback book printed on thick, matte paper with relief printing and gold leaf on the cover. Impeccably designed, if somewhat indebted to the Ware school of production design, it is simply an immensely attractive comic. More than anything else, however, this has to do with the art within. Winshluss has long been an energetic draughtsman, merging the subversive sensibilities of the underground movement with a palpable sense of punk abandon that owes more than a little to the great bad-taste humorist Vuillemin. The result are gruff cartoons, grimy with saturated brushwork, that refreshingly tend to reach beyond the comfort zone of the artist, resulting in a kind of frenetic energy of invention that is both spectacular and moves the story along with humour and efficiency. This time around Winshluss may have bitten off more than he could chew, however. His Pinocchio is a free adaptation of the original 1883 story by Carlo Collodi, with more than a nod to Disney’s 1940 movie, but really is its own beast. It is a highly ambitious, sprawling epic of human folly in direct lineage from the expressionist woodcut novels of the modernist era. Rather than a wooden puppet with no strings, the title character here is a mechanical warrior, capable of great destruction, but he still has the mind and heart of an innocent boy. The moment of animation comes when Winshluss’ ne’er-do-well version of Jiminy Cricket sets up shop inside the robot’s metallic skull. 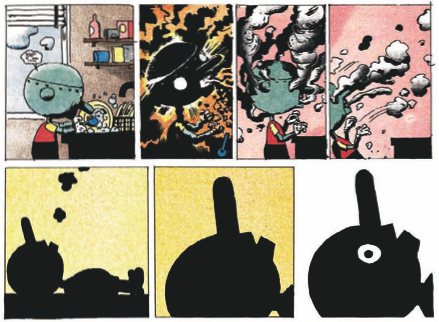 Lamentably having dropped the idea of the telltale nose and replaced it with a flamethrower, the cartoonist uses said aggregate to set off the story with a deadly spurt of flame that changes all and sets our hero on his way into a world of hurt, about which he is utterly unenlightened but also impervious. Along the way, he meets twisted versions of Stromboli, Lampwick and the leviathan Monstro, but also twisted travellers from other fairy tales such as Snow White and seven very fucked-up dwarfs. 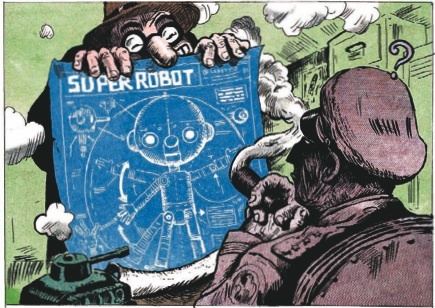 As per the original plot, Pinocchio’s creator Gepetto, here an immoral weapon smith, sets out in search of his golden boy, hoping to one day reap the riches his super-weapon will surely earn him with the Masters of War. The story is told in nigh-pantomime, with the sequences featuring the travails of the cricket — the artist’s obvious stand-in — under the metal dome being amongst the few exclaimed in loud comic book dialogue. Many individual plot threads are interwoven, and often staged with the conventional trappings of the feuilleton literature of the era from which the cartoonist has drawn his raw material. Winshluss impressively switches between a plethora of drawing styles, ranging notebook style sketches over lushly detailed penwork to fully painted panoramas. His frequent partner Cizo and a few other collaborators lend the pages a look reminiscent of vintage newspaper strips through their sensitive and suggestive watercolouring. This, in other words, is a book that very self-consciously pulls out all the stops. It wants to merge what are perhaps the two quintessential strands in the comic book tradition, attempting to be both grand allegory and punk subversion. The problem, however, is that Winshluss’ interests as a creator ultimately seem as limited in scope as the artistic persona he creates for himself in the cricket — inebriated, cynical and faux fatalistic. Beyond all the bells and whistles, his idea of poignant fun is still to have Mickey Mouse shoot heroin, and Goofy in the head, as he has done many a time before. Pinocchio is admirable for its ambition and the sheer enthusiasm with which it is executed, but it never manages to transcend the slightly juvenile glee that so often comes with assumed misanthropy, and remains ever predictable and superficial in the portrayals of capitalism, fascism, unscrupulous science, and sexual depravity that — ironically yes, but still — have been invoked to serve as its alibi as a Grand Work of Comics. A slacker joke writ large. Winshluss, with Cizo, Frederic Boniaud, Thomas Bernard, Frederic Felder, Pinocchio, Albi: Les Requins Marteaux, 2008.